Target Transfers screen printed Polytran custom heat transfer is our most popular transfer system. Suitable for use on cotton, polyester, poly-cotton blends and more. It’s a powdered Plastisol heat transfer, due to its opacity it is suitable for darker garments and fabrics. Available in quantities from 25. 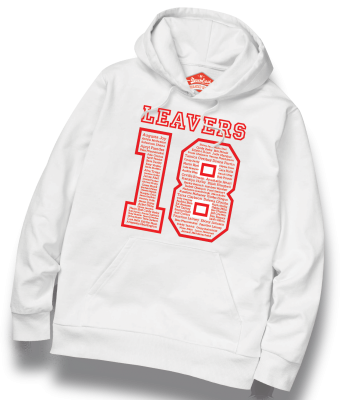 Our UK manufactured custom transfers are despatched within two working days. Following confirmation of the artwork, colour references, and agreed payment terms. From t-shirts and polo shirts to hooded sweatshirts and bags, this process allows you to produce custom heat transfers for quick and easy application to meet your ongoing needs, as well as low and high-volume one-off orders. The heat transfers can be Pantone colour matched to your specific requirements. Polytran Custom Heat transfers are suitable for both light and dark fabrics. There are very few uncoated fabrics that cannot be printed with our Polytran heat transfer process. It is important to test your fabrics – Get in touch if you need a free sample to test with. Wash using a mild detergent. Tumble dry on a low setting on household machines. Can be ironed onto reverse (without steam). To create your custom heat transfers we require a vector file (with text saved as outlines), along with Pantone colour references for the specific spot colours required. If you do not have the Pantone colour reference, we can help you to choose the correct colours for your design. Get in touch if you require help completing your artwork. We are always happy to help with advice, call us on 01376 326351 or email info@targettransfers.com if you need further assistance with custom heat transfers.